Humanity hangs in the balance as the Shadowhunters fight in an ancient war between angels and demons. Season 3 premieres Tuesday, March 20. – Jace’s concerns grow about his mental state and turns to Luke for information on his family’s past. 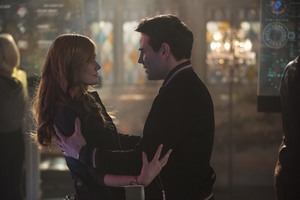 Clary and Izzy go after a rogue vampire and Simon hunts for a new apartment. Dating choices, double date with your ex – good or bad idea? The cast of Shadowhunters explains.